Whilst there are clearly cost savings to be made by bringing outsourced electrical maintenance services in-house, many companies lack the resource to do so. Thermal imaging is a good case in point. The cost of this technology is falling in line with increased demand whilst the functionality of cameras continues to increase. On this basis there should be ample opportunity for maintenance savings to be made. But the problem lies not with the cost of the survey equipment itself but with the necessary and time consuming safety procedures that must be observed when inspecting energised systems. A company without in-house thermal imaging typically needs a team of people to undertake this work. One or more of its own electricians is required to accompany the thermographic consultant on-site to remove panels for testing. And all need to be kitted out with appropriate personal protective equipment (PPE) for the purpose. So, not only is it a minimum of a two-person job but man hours are lost in suiting up and down and in waiting for each other to perform their respective tasks. The non-productive time involved is staggeringly high. Alongside this is the need to minimise risk, a factor often driven by insurance. The frequency of preventive maintenance is key here but this only serves to exacerbate the problem. The safety considerations involved in the survey add cost and this increases exponentially with every inspection added to the maintenance schedule. It's hardly surprising to learn therefore that many sites do the best they can with the resources they have, omitting to carry out regular checks on energised systems as it is just too onerous a task. The problem here is that these systems are often critical to the production process and could therefore cost the company dearly in the long run. It's a high risk strategy. There is an easy solution however - the inclusion of infrared windows. This simple move can make a big difference to the economics of effective electrical maintenance, making it viable for any manufacturer to implement its own thermal imaging programme. A local power generation site provides a good example of what can be achieved. It saved an impressive 90% on its maintenance costs by installing 203 IRISS windows. Their installation has allowed the routine inspection of energised systems that were previously bypassed. Furthermore the entire task has become a one man job as there is no need to remove panels or wear increased levels of PPE. Total man hours required to complete an inspection dropped from 468.3 hours to just 33. And as a result of these important improvements, the site is now planning the purchase of its own infrared camera and to provide thermography training for its in-house maintenance engineers. This will lead to even more cost savings and help ensure its plant remains fully productive. 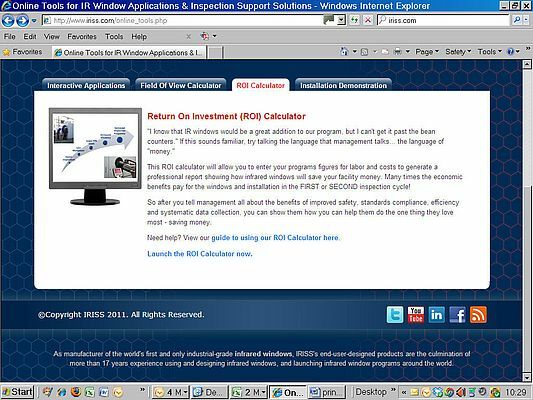 To help others assess the potential cost savings of adopting infrared windows IRISS provides a return on investment calculator on its website iriss.com. IRISS manufactures the world's first and only industrial-grade infrared windows. They allow efficient and safe infrared electrical surveys to be conducted, reducing risk and cutting associated costs.